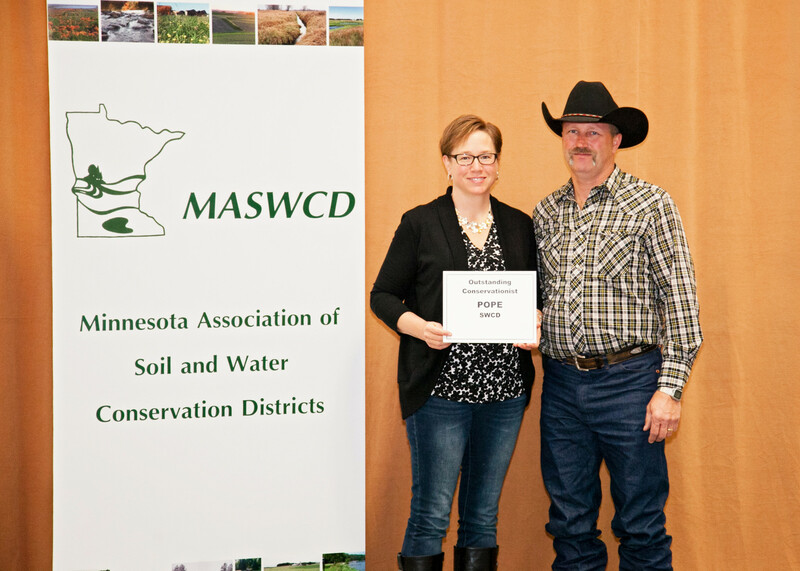 Paul and Barb Koubsky will be honored as outstanding conservationists at a Dec. 6 luncheon at the annual convention of the Minnesota Association of Soil and Water Conservation Districts (MASWCD) in Bloomington, Minn.
“We’re proud of the Koubskys for what they’ve done in conserving the natural resources in our area,” said Keith Nygaard, supervisor of the Pope Soil and Water Conservation District, which nominated the Koubskys for the award. “It’s great to be able to recognize the work they’ve done locally. The Koubskys operate a diversified farm operation raising soybeans and corn with cover crops including rye and wheat. The operation includes 130 cow/calf pairs on a rotational grazing system including grazing the cover crops on 60-90 acres. Over the years they have planted shelterbelts and buffer strips, implemented a waste management system, grid sampled the operation for nutrient management, constructed 17 water and sediment control structures, treated invasive species including wild parsnip, and implemented cattle exclusion practices. “We’re proud of the Paul and Barb Koubsky family for what they’ve done in conserving the natural resources in our area,” said Tom Talle supervisor of the Pope SWCD. The Koubsky’s are good stewards trying new practices in their diversified operation to improve the land for future generations. MASWCD sponsors the Outstanding Conservationist Award, with support from The Farmer magazine. Additional information on the event is available on the Association’s web site at www.maswcd.org. The Minnesota Association of Soil and Water Conservation Districts (MASWCD) has named Dorrich Dairy, Glenwood, Minnesota as one of eight Area Finalists in the 2015 Outstanding Conservationist Award Program. 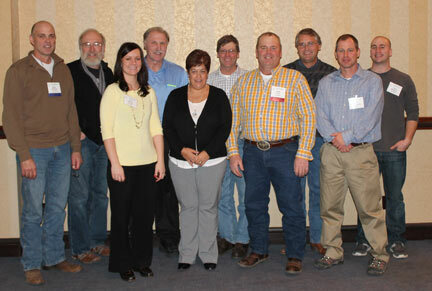 Dorrich Dairy was recognized at a Dec. 8 luncheon at MASWCD’s 79th annual convention in Bloomington. The awards program recognizes farm families, individuals, conservation organizations, and other groups for their accomplishments in implementing conservation practices and improving Minnesota’s natural resources. Of the eight finalists, one was announced as the State’s Outstanding Conservationist of the Year at the Dec. 8 luncheon. “We’re proud of Dorrich Dairy and the Vold Family for what they’ve done in conserving the natural resources in our area,” said Tom Talle supervisor of the Pope Soil and Water Conservation District, which nominated Dorrich Dairy and the Vold Family for the award. “It’s great to be able to recognize the work they’ve done locally. They’ve provided a wonderful example for us by implementing buffers, no-till, pest and nutrient management, wildlife practices, water reuse, cover crops, and much more,” he said. They are also very active in the community and provide education an outreach to the community to share their expertise about agriculture. Dorrich Dairy was also just recently recognized as the first operation certified in Pope County through the Minnesota Department of Agriculture Ag Certainty program. 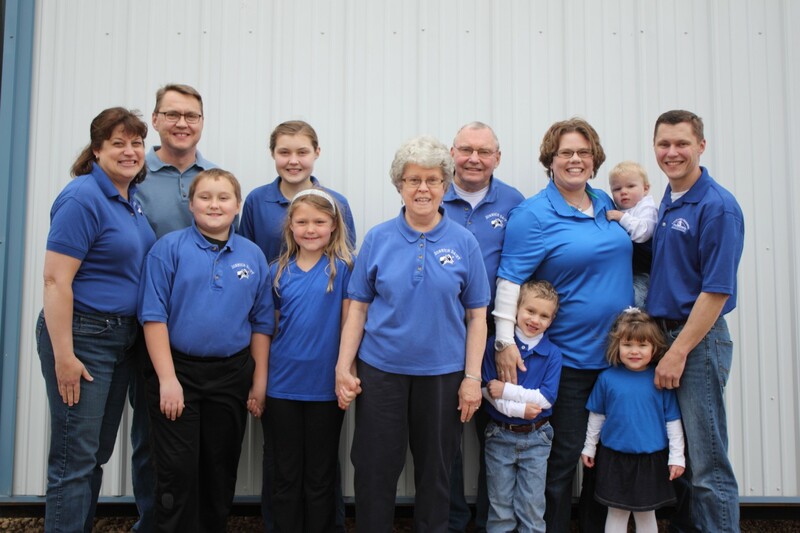 The Halls Family was selected to represent Pope County by Pope SWCD at the 2014 Minnesota Association of Conservation Districts Convention held December 7-9th, 2014. They were one of 64 county conservationists being honored for their efforts in implementing conservation and improving Minnesota’s natural resources. 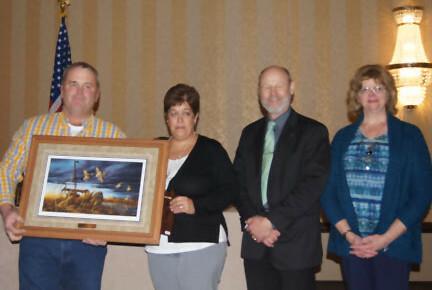 The Halls Family was awarded top honors at the Convention they were selected as this year’s State Conservationists and were awarded a print from the Minnesota Association of Conservation Districts and the Farmer Magazine. The Halls Family was also honored by Pope County on December 16. Board and Staff with the outstanding conservationists. The Halls Family has been implementing projects and practices in the last several years including: 150 acres of cover crops that are used for rotational grazing, wildlife purposes, and wind erosion; conservation tillage on steeper slopes and highly erodible soils; 180 Chi-Angus cattle that graze on public and private lands in cooperation with other agencies while promoting soil health and a longer grazing season; raise club lambs and several head of sheep; invasive species management; soil tests in spring and fall; use of an aerial vehicle to scout areas for pest and nutrient management, and heat stress; two feedlot upgrade projects; riparian buffers around wetland areas; enrollment of 73.9 acres into a wetland restoration project; food plots for wildlife; and a member of the Simon Lake Challenge to rotate grazing on public and private lands. The Halls Family is also very active in the community including Pope County Extension and 4-H, State Beef Board, Pope County Fair Board, Dairy Board, Glacial Ridge Cattlemen, State Cattleman’s Organization, West Central Sheep Producers, Simon Lake Challenge Steering Committee, Farmer Leader for grazing network, Pope Soil and Water Conservation District Board member, and volunteering at educational events to promote conservation projects they have implemented and used. 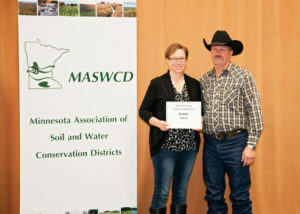 PURPOSE : The Minnesota Association of Soil and Water Conservation Districts (MASWCD), with support from The Farmer magazine, offers the the MASWCD Outstanding Conservationist Award to recognize individuals, conservation organizations, and others for outstanding accomplishments with implementing conservation practices and improving Minnesota’s natural resources. Recognition will be given for accomplishments between July 1 of last year and June 30 of this year. Each year Pope Soil & Water Conservation District selects an Outstanding Conservationist of the Year. ELIGIBILITY: In order for an entry to be included in the recognition program, the member district must have completed and submitted the District Capacity Award score sheet to the MASWCD office by the deadline. SWCD supervisors, SWCD employees, and employees of our state and federal agency partners are not eligible for recognition through this program. If you would like to recognize an SWCD supervisor, please consult materials for the MASWCD Outstanding Supervisor Award. If you would like to recognize an SWCD employee, please consult materials for the Outstanding District Employee of the Year Award (administered by the Board of Water & Soil Resources). Once selected the county winner(s) will compete with the 91 SWCD’s for overall Outstanding Conservationist of the Year. This award is given annually at the Minnesota Association of Soil & Water Conservation District Annual Convention in December.